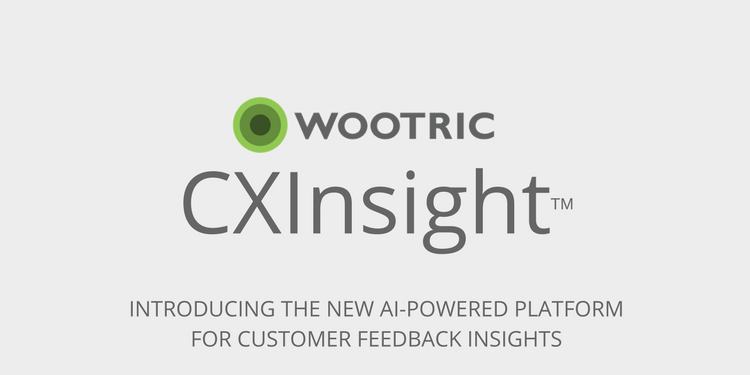 Today we’re thrilled to announce the beta launch of Wootric CXInsight™. This significant expansion of our platform enables companies to input large volumes of qualitative data into Wootric — from any source — for auto-categorization, sentiment analysis and visualization. Why did we build CXInsight? We’re in the business of feedback, and we’ve collected a lot of it for our customers. We’ve seen the growing pains of companies scaling to meet the demands of an increasingly connected world — they’re talking to customers more than ever before. Companies are inundated with feedback across all kinds of channels–surveys of various kinds, social, support tickets…and it’s piling up. Valuable, qualitative, “voice of the customer” is coming from everywhere. It’s overwhelming, and usually untapped. It’s one thing to run an efficient Net Promoter Score program and have a process for acting on that specific feedback. We (and our customers) certainly know this well! It’s quite another to reconcile that feedback with the things that are being heard by the support team, the sales team, the marketing team. Do you even know all the sources where your company is collecting customer feedback today? Whose voice gets priority and why? Without a systematic approach to aggregating and analyzing feedback in one place, it is a struggle to provide a unified Voice of Customer perspective that can guide improvements to customer experience. Market research, customer insights, VOC teams we’re talking to you, and we want to help. We want to elevate the voice of the customer for the companies we work with, and we are firm believers that artificial intelligence (AI) is the key to unlocking insights. Did you know that only 13% of companies have unified their customer intelligence? It’s not for lack of interest. 75% of companies say they can’t act on the majority of data they collect, owing in large part to disjointed systems and an overwhelming volume of data. This is hard. Companies need efficient and intelligent solutions to help them stay competitive. Wootric is ready to lead the way with state-of-the art AI-powered analysis. We are as passionate as you about using data and analytics to improve your customer’s experience. How does Wootric CXInsight™ work? Like all things AI, CXInsight gets more intelligent with time, and is only as good as the data it has to learn from. We are not simply riding the machine learning wave–we’re launching with a big running start. From our years in the survey business, we’ve analyzed millions of real-world customer feedback comments. A lot of that data has been carefully categorized. And that allows CXInsight to deliver meaningful AI-driven analysis of your qualitative feedback from day one. Sentiment, too! CXInsight already knows what topics your customers are likely to be talking about in any given industry. Our trove of categorized feedback serves as training data for continually improving the proprietary algorithms that Wootric has developed to automatically analyze qualitative feedback. That feedback spans across all possible industries — ranging from SaaS to ecommerce products, media and enterprise businesses in established industries. Our classifications are curated for your industry. CXInsight reporting lets you quickly slice and dice your way to insights across all your data sources. 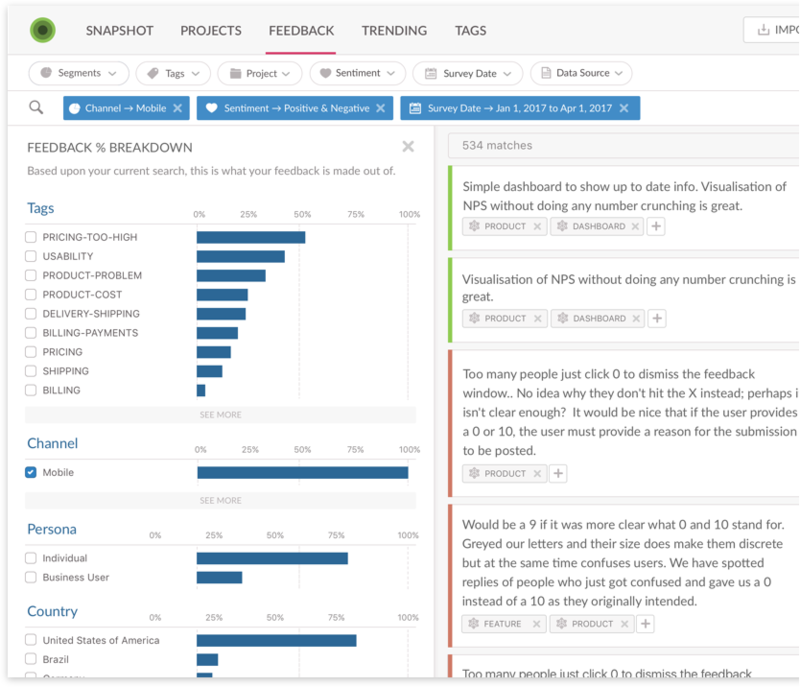 Our dashboard is designed to visualize your feedback with extremely powerful and flexible searching and grouping capability. We want you to be able to focus on the key drivers of customer satisfaction, prioritize, and track your progress on the things that your customers care about. We’re building a CX platform using state-of-the art AI. If you want to learn more about our AI approach, check out our engineering blog. If you want to be part of this journey with us, we are kicking off our early access today. Sign up and we’ll reach out to learn more about your application.